It’s official! I have been chosen as a Kayo Ambassador and received Kayo’s amazing body products in exchange for sharing my knowledge of beauty and health for a better body! Maybe you remember last year I tried several of Kayo’s body beautiful products and I fell in love with them! Be sure to read my review of Kayo Better Body Care products to get all the information! So, Recently I was able to try a few new products from Kayo. The first product that was new to me was the Kayo Concentrated Firming Serum. It was the 2016 winner of the Shape beauty award. This award-winning product, that is made in the USA, comes in a glass bottle with a pump. This serum delivers intense hydration which helps provide the look of tighter, smoother and firmer skin. Now don’t be confused and think this is a weight loss product, as it is not. Hydrated skin looks firmer. I can attest to that one. This product is fragrance free and can be layered under other products. You can use this product on abdominals, glutes, thighs, ankles, arms and even your neck to achieve a firmer appearance. It can be layered under the Kayo Body Beautiful Creme or Oil. When I use this product I truly feel as if I am having a spa experience in my own home, and I love that it is fragrance free. Most firming products that I have tried have a scent which gives you away! Not this one! Another new product for myself is the Kayo Daily Remodeling Serum. Massage into the entire body or spot treat where deeper attention is needed. Allow a moment for this product to dry to a sateen finish. 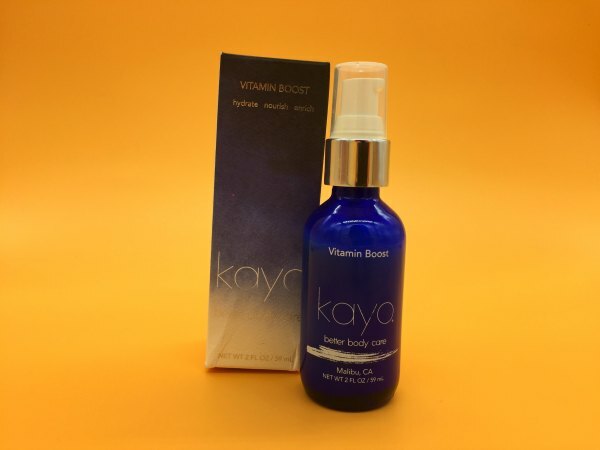 For deep moisture apply under Kayo’s The Body Beautiful Crème or Kayo’s Body Beautiful Oil. This product is also made in the USA and comes in this glass container with a pump. Kayo believes that your body should be treated the same as your face and thus makes their skin care line with face grade ingredients. If you are unfamiliar with layering products you would begin with the lighter product first like serums , heavier products like lotions and oils after. I found this product to be absorbed quickly. It’s perfect to use when you need to get dressed in a snap! My only complaint about these products are that the directions are on the boxes not the actual containers. Personally, I forget what goes with what! So, I needed to save the boxes, but that’s just me. Maybe they will hear me and get those directions on the containers! I think this is a small complaint for a product line that I love! As an Ambassador for Kayo I get to offer my readers a discount code for their first order! Use the code: MILENAB15 to receive 15% off your first order. Visit Kayo at http://bit.ly/2zPVL0k and feel the luxury of great skin care! Disclosure: As a Kayo Ambassador I not only receive products, but I also receive compensation for sales made through my link. I fell in love with this brand before I was asked to be an ambassador. All thoughts are my own and have not been influenced. I love the pretty bottles! These sound like wonderful skin care products! Awesome discount! I’ll have to check it out, this looks like a great bunch of products. This sounds like a great brand and I love the beautiful bottles. I will have to check it out (and I agree about putting instructions on the actual products rather than on the packaging!). wow congrats on being a Kayo Ambassador! This products look really nice. Love the packaging and then a 15% discount I am in! How exciting to become an ambassador! I have never heard of this brand before but it seems like they have great products! Congrats on being selected as an ambassador for such a nice product. The packaging is beautiful. I like to keep lotions sitting on my bathroom and kitchen counters so I like it when they look pretty too.